The expat community Yabangee will celebrate the traditional Mexican holiday of Dia De Los Muertes with a special event on Nov. 2. The city's expat community will be coming together this month to test their knowledge, showcase their skills and enjoy great food and music. The following are just some of the great events planned for this month by many of Istanbul's foreign residents. Each of these events will be a great way to meet new people from all over the world in their adopted home of Istanbul. As an alternative to the vast array of Halloween parties to which I have previously devoted an entire article to, the "Real Istanbul Pub Quiz," will be taking place on the terrace of the James Joyce Irish Pub, located on Balo Street in Beyoğlu. This quiz series has been taking place for years at this popular expat hangout and the questions are asked in English and there's even a visual film round. 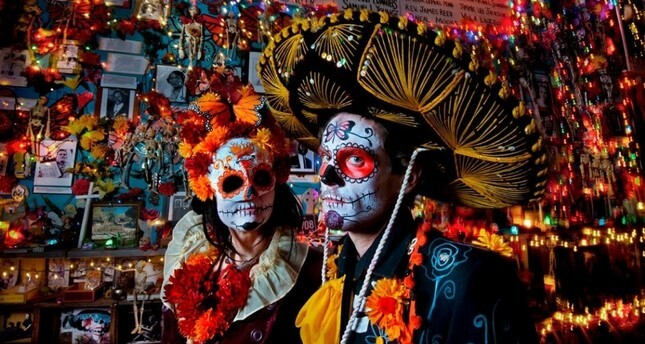 The quiz starts at 8 p.m. and goes on until 10:30 p.m.
On Friday, Nov. 2, Yabangee, which is an English website and community platform for expats, has organized a special event to celebrate the traditional Mexican holiday of Dia De Los Muertes that will take place at Los Altos. Easily the most popular Mexican restaurant in the city, Los Altos also happens to have spectacular panoramic views from its rooftop location in the Tomtom district of Beyoğlu. There will be DJs playing and the venue will be decked out for the event with makeup artists present to paint faces in the cryptic style pertaining to the tradition. The event will start at 10:30 p.m. and will go on until 4 a.m. Entry is TL 30 (approximately $5.50) and includes a drink.There will also be a special Mexican feast held before the event from 7 p.m. to 9:30 p.m. with a choice of two decadent menus; you can reserve a table for through Yabangee. Casablanca Cuisine is a newish pop-up dinner series held by Moroccan expat Assia in various venues throughout the city. On Saturday, Nov. 3, starting at 8 p.m., Casablanca Cuisine will be hosting a dinner in Cihangir that will introduce the culinary treasures of northern Morocco and the Andalusian and Spanish influence on its cuisine. Casablanca Cuisine will also be holding a dinner in Bahçeşehir on Nov. 11. To find out more, visit the Casablanca Cuisine Facebook page. On Friday, Nov. 9, Yabangee will be hosting "Karaoke Night: Release Your Inner Star" at Arsen Lüpen in Beşiktaş. Entrance is free and doors open at 9:30 p.m.
Pop-Up Dinners Istanbul will host an Indian cuisine themed dinner party "All About Curry," on Nov. 17. On Saturday, Nov. 10, Pop-Up Dinners Istanbul will be "Raising the Bar" in a special dinner devoted to bar food from all over the world. Run by a former restaurateur and long-term Istanbul expat, the Singaporean and Dutch Kay prepares exquisite pop-up dinners from her home in Cihangir, which are popular with the expat community. A great way to meet new people and share a fun and delicious experience, this particular evening will also include a culinary-themed quiz. Make sure to reserve your spot on the Facebook event page as spots usually fill up early for these events. The month continues with a costume-filled Masquerade Ball entitled "A Night of Mystery" which will be held by Yabangee at Beat Terrace, located on Yeşilçam Street in Beyoğlu. Doors open at 10:30 p.m. and entrance is free to this event that will have guests donning disguises to become someone else for the night. Pop-Up Dinners Istanbul will be serving up a meal centered on Indian cuisine entitled "All About Curry." This will be a family-style served dinner with different dishes constantly coming from the kitchen and rice replenished throughout. Among some of the dishes on the menu is a fish curry with coconut cream, chicken tikka masala, dal makhni, paneer masala and naan. Served from her home in Cihangir, former restaurateur Kay's dinners are a popular meeting ground for foreigners residing in Istanbul. On Sunday, Nov. 18 from 10 a.m. to 6 p.m. there will be a very special Thailand and East/South Asia Market held at the Mövenpick Hotel Istanbul in Levent. Organized by the Thai Women in Turkey organization, this will be a great opportunity to try a variety of cuisine from the region as well as peruse Thai gifts, handcrafts and accessories. There will also be Muay Thai mini matches and dances performed as well as a Thai Fabric Fashion Show and a Thai Song Singing Show as well as karaoke in both English and Thai. On Tues. Nov. 20, Yabangee's monthly Trivia Night resumes for a 15th edition at the new Arsen Lüpen in Beşiktaş. There are six people on each team and participants can come alone and be paired with others. The game starts at 8 p.m. and questions are asked in English and Turkish and the top three teams win prizes. Participants must be over 18 to play, cellphones are not allowed during the quiz and the cost to play is TL 20. Ongoing event series: Spoken Word Istanbul is the city's sole multicultural and English language open mic series that is a wonderful venue for anyone wanting to take the stage to share their talents for a crowd and for those who enjoy watching entertaining performances from the expat community as the audience. The event takes place every Tuesday night at Arsen Lüpen in Beyoğlu starting at 8:30 p.m.
Yabangee also regularly hosts music-themed nights at Beat in Beyoğlu on Thursday's and Sundays. This month's themes include "Champagne Showers" on Nov. 1, "We are Hip Hop Night" on Nov. 8, "Hippie Night: Embrace Your Inner Flower Child" on Nov. 15 and "Flashback Nights: All the Old School Hits" on Nov. 18. There will be a "Great Gatsby Night" on Nov. 22 and an "Africa Night: A Celebration of World Music" on Nov. 25 and "Latin Night" on Nov. 29.